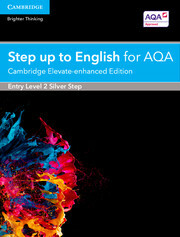 Written for the AQA Step up to English Entry Level 3 Certificate for first teaching from September 2015, and tailored specifically for EAL students, this resource provides extensions to the Cambridge Step up to English projects designed for second-language students. Designed for maximum flexibility, teachers can pick and mix the projects and support differentiation in mixed-ability classrooms using other Cambridge Step up to English resources. Please note that you will need the Teacher Planning and Delivery Resource and the relevant Entry Level worksheets to make full use of this product. Designed specifically for EAL students, with activities that will help develop language skills in preparation for GCSE. Developed to work alongside the Cambridge Step up to English Entry Level 3 resources to support EAL students in a mixed-ability classroom. 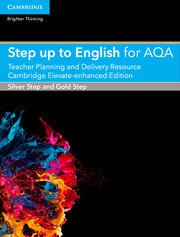 The pack contains specific teacher guidance and learner resources for each individual Step Up to English project to enable the learner to access the course fully and prepare to progress on to GCSE. Also available within a Complete Bundle Pack, alongside resources for Entry Level 1, Entry Level 2, Entry Level 3, EAL learners and full teacher planning and delivery support.